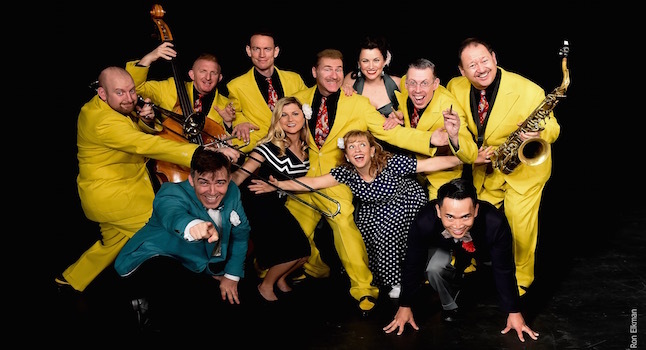 The Jive Aces are the UK’s No.1 Jive & Swing band and renowned worldwide for their high-energy spectacular swinging show, their viral video “Bring Me Sunshine” and for being the first live band to reach the final rounds of “Britain’s Got Talent”. 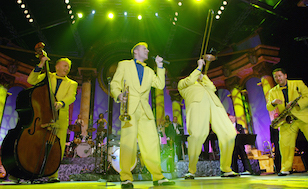 The show includes classics like “When You’re Smiling”, “Mack The Knife” and “Sing, Sing, Sing”, plus “Smile”, “L.O.V.E.” and “Bare Necessities” from their fabulous new album, “Spread A Little Happiness”. 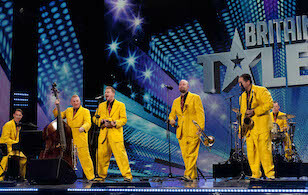 The in-demand sextet average 300 shows a year and have worked with Van Morrison, Keely Smith and performed for HM the Queen. They headlined and sold-out the Royal Albert Hall and thousands of festivals, theatres, dancehalls, etc, in 35 countries, including Buckingham Palace for the Coronation Festival, Trafalgar Square for the Olympics and major theatre tours in the US. Their most popular music video, “Bring Me Sunshine”, is a viral hit with 2.8 million views on Youtube and has won seven film festival awards. It’s so uplifting it’s actually been prescribed by a doctor!